Warm a new home with a delicate Vluzi bedtime lamp (37cm) and a pot of Ginger Flowers and Holland Daisies for a new couple or a dear friend. Lamp delivered beautifully gift wrapped. 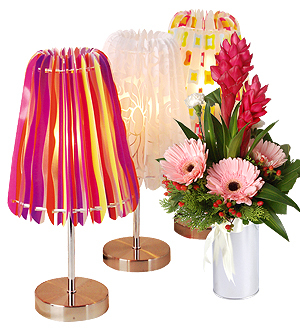 Lamp shade available in coloured squares, motif white, and rainbow stripe. Immediate same-day delivery applies for delivery within Klang Valley. For outstation deliveries, please provide at least 3 days notice.